The Northern Irish golfer will partner Victor Dubuisson this afternoon. The pairings for this afternoon. WITH THE MORNING fourballs almost complete, team captains Paul McGinley and Tom Watson have named their line ups for the afternoon’s foursomes with both combining two new pairings with two that played this morning. Perhaps surprisingly, Watson has decided not to send out Patrick Reed and Jordan Spieth who claimed a 5&4 victory this morning. 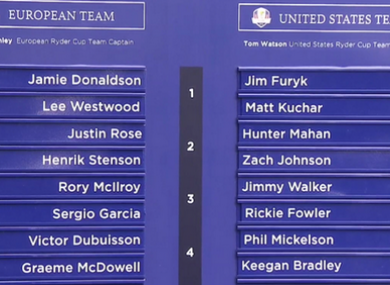 The first match out will see Ryder Cup rookie Jamie Donaldson and Lee Westwood take on Jim Furyk and Matt Kuchar. Westwood lost both his foursomes matches in 2012 when partnered with Francesco Molinari and Luke Donald. Fresh from their 5&4 win this morning, Justin Rose and Henrick Stenson take on Hunter Mahan and Zach Johnson. Johnson won both his foursomes when paired with Jason Dufner at Medinah. Rory McIlroy and Sergio Garcia – who are still on the course – will take on Jimmy Walker and Rickie Fowler. The Ryder Cup rookies are also still involved in the this morning’s action. The final game will see Victor Dubuisson make his Ryder Cup debut alongside Graeme McDowell. They take on Phil Mickelson and Keegan Bradley. Email “McDowell to partner rookie as Friday foursomes named”. Feedback on “McDowell to partner rookie as Friday foursomes named”.